You won’t find better for your burner! Nothing beats an open fire or a woodburner on a cold night. 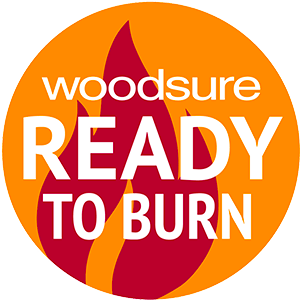 As many homeowners know, the quality of wood or solid fuel you burn can have a huge effect on the heat your fire puts out. Not only that – trying to get great quality logs or solid fuel delivered to your door isn’t as easy as it should be. Unless you buy from The Log Store. We’re a family run business that likes to do things a little differently. We deliver the best quality logs FOR FREE when you spend £100 or more. Whether you’re in Bournemouth or Dorchester, Weymouth, Yeovil or beyond, your logs are hand delivered by our own two man team across Dorset and South Somerset. How much do you get in a bag of our logs? Get a roaring fire every time with our Kiln-Dried hardwood with less than 20% moisture. That’s why it’s our customer’s favourite; it burns beautifully. We get asked if we can help with solid fuel too - and now we can, delivered in 40kgs easy store handy bags. We have one simple aim. We have one simple aim. To deliver the very best ready to burn logs directly to you whenever you need them, wherever you want them – with no hassle to you! Our log store bags. 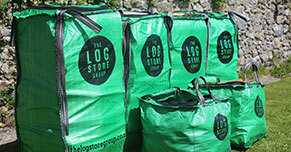 Our log store bags. 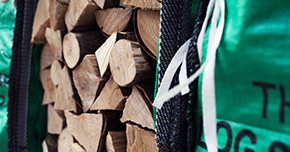 All our firewood is delivered in our Log Store Bags which are easy to store, with no need for re-stacking. You simply exchange your empty bags for full ones on delivery of your next order. The ultimate container. The ultimate container. 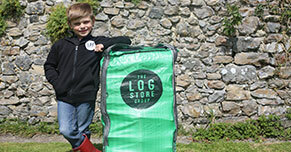 The super strong and reusable log store bag is designed to hold as much as we used to sell in our loose loaded dumpy bags. We do this by tightly handstacking the logs – more logs, less space!